The Battle of Świecino (named for the village of Świecino, near Żarnowiec Lake, northern Poland) also called the Battle of Żarnowiec or in German Battle of Schwetz, took place on September 17, 1462 during the Thirteen Years’ War. The Poles commanded by Piotr Dunin, consisting of some 2000 mercenares and Poles, decisively defeated the 2700 man army of the Teutonic Knights commanded by Fritz Raweneck and Kaspar Nostyc. Auxiliary forces sent by duke Eric II of Pomerania, an ally of the Polish king, did not enter the battle. 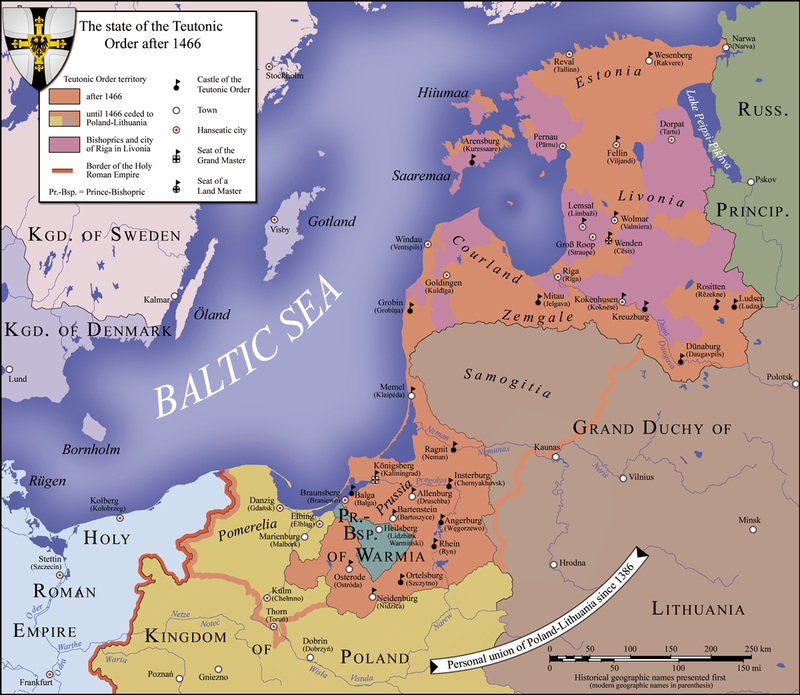 ‘‘Thirteen Years’ War.’’ The territorial struggle between the Teutonic Knights and the still feudal kingdom of Poland-Lithuania climaxed in the mid-15th century. Within Prussia economic advances had outstripped political modernization. By mid-century affluent Prussian cities were desperate to escape the economic constrictions imposed on them by the still-feudal economic policies and taxes of the Brethren, and so formed an alliance with the Junkers. This strange alliance was possible because also feeding the rebellion was Junker disgruntlement with the foreign birth of many ‘‘Sword Brothers.’’ The leading cities of Prussia (Danzig, Elblag, Torun, Elbing, and Thorn), later joined by 16 other towns, and the Junkers formed the Preussische Bund (‘‘Prussian Confederation’’) in 1440. In 1452 the Bund appealed to Emperor Friedrich III to mediate their grievances with the Brethren. Instead, early the next year Friedrich ordered all Prussians to submit. This forced the Bund to seek help from the Poles. In early 1454, the Bund secretly asked to be incorporated into Poland. Casimir IV signaled that he would support the rebels if they made a public request: his interest was to detach Prussia from the Teutons and annex it to Poland- Lithuania. From February 6, the Bund began taking over and destroying lightly garrisoned Teutonic castles. On March 6 a formal agreement was reached between Casimir and the Bund asserting Polish sovereignty over Prussia and declaring war on the Brethren. Since most of the Teutonic castles in Prussia had fallen to the rebels even before the war officially started, it was widely expected to be a short campaign. In fact, it lasted thirteen years. Cracks in the Teutonic edifice were offset by initial Polish weakness: despite sharing Casimir as joint sovereign, the Lithuanians refused to send troops or finance the war in Prussia. Other Polish troops were tied down by the threat to southern Poland of a possible Ottoman attack. As a result, an undersized Polish army was sent into Prussia. After a desultory and unsuccessful siege of Chojnice by the Prussians, this force engaged in a major battle outside the city. 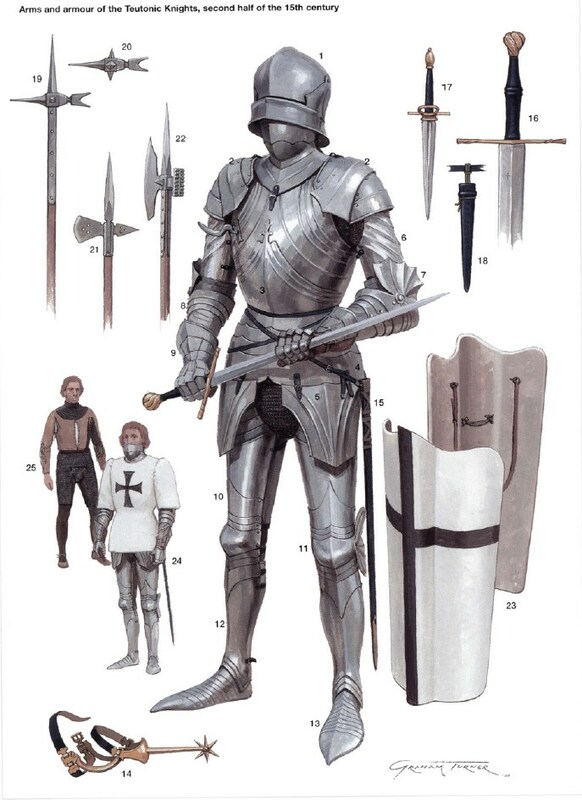 On the field at Chojnice (September 18, 1454) the Poles and Prussians were soundly defeated by the Teutonic Knights, aided by a large band (9,000 horse, 6,000 foot) of German mercenaries. Teutonic victory at Chojnice ensured that the war would go on. The rebels seized most of the Order’s arsenals and castles in Prussia, but failed in an effort to storm the citadel and Teutonic capital of Marienburg (Malbork). The financial weakness of the Order meant that its Grand Master had to promise the mercenaries control of Prussian cities in lieu of wages. Still, the Knights raised small armies from among loyal Brethren outside Prussia and by conscripting their enserfed peasants. While the Prussian towns remained determined to break free of Teutonic overlordship, the larger Hanse cities allied with the Knights. Nor did the international situation favor either side: most other powers were preoccupied with their own unsettled internal affairs or other wars, and remained neutral. The Poles were also forced to hire mercenaries, primarily Czechs and Silesians, greatly straining the royal purse which was light in the best of times. Casimir’s repeated call-ups of peasant levies were only agreed to by the Sejm after he made heavy political concessions to the nobility, which started the Polish state down a road that ultimately led to a fatal weakness at the center. The Poles besieged Lasin in 1455, but again their lack of siegecraft and cavalry-heavy army told against success. As war taxes began to bite into the rebel cities the Teutons enjoyed better luck. Their army was better equipped for siege work, and several towns fell to a combination of internal unrest and external military pressure: Konigsberg surrendered on April 17, 1455, and Knipawa gave in on June 14, 1455. When the Brethren again ran out of money, however, some mercenary captains took Prussian towns for themselves and milked them dry. Several companies also negotiated with the Poles to transfer possession of fortified cities. Now, external powers also intervened: the Holy Roman Empire moved to ban the Bund and the pope threatened to excommunicate any who refused to come to terms with the Teutonic Knights. Denmark declared war on Poland and the Bund but that was largely an empty gesture since Denmark was already engaged in a major naval war with Sweden. Still, this emboldened the Knights, who refused terms to the Poles and rebels. The Poles replied by hiring still more mercenaries from Silesia, more mercenaries from Russia, and even Tatars from the Crimea. Fighting resumed, but with both sides suffering internal dissension and bad finances the war settled into a pattern of minor raids and indeterminate sieges. A Prussian fleet, mostly built in Danzig on orders from Poland, defeated a Teutonic fleet at Bornholm (August 1457). As the war lengthened, the fundamental economic weakness of the Brethren was revealed. They were not as rich as in the past and struggled unsuccessfully to meet the payroll of their mercenary troops. In 1457 Bohemian mercenaries garrisoning Marienburg mutinied, sold the fortress to the Poles, and went home. The loss of the Teuton capital should have ended the war but on September 28, 1457, Marienburg was retaken in a surprise assault by the Knights that was abetted by internal treachery which opened its gates before they were forced. In 1458 the Poles invaded Prussia again, employing Tartar auxiliaries, and besieged Marienburg. Yet again the Poles proved incompetent at siege warfare. The campaign collapsed and a cease-fire took effect that lasted nine months, into 1459. The Danes withdrew from the war, an act almost as little noticed as their entry. Pope Pius II tried to mediate peace, hopeful that he could get all sides to join in a new crusade against the Ottomans. The Poles rejected the pope’s entreaties and his threats of excommunication (eternal damnation was not what it used to be). The Knights were briefly resurgent: they defeated the Danzig militia and burned part of the city in July 1460. The fundamental weakness of the Polish recruitment system, based still on feudal levies of peasants and independently minded noble cavalry, became apparent in deep resistance to new enlistment drives. Casimir finally persuaded the nobles to turn the fight over to professionals. That meant raising funds to hire a mercenary army rather than raising peasant levies to be led by amateur noble captains. These harder and more skilled troops crossed into Prussia in 1461. At Swiecino (August 17, 1462), the defeat they handed to the Brethren’s field army was so sharp that the end of Teuton rule in the eastern Baltic came into sight. Loss of the Brethren’s fleet at Zatoka Swieza (September 15, 1463) so severely damaged the Order’s maritime interests and profits in the eastern Baltic that the Knights could no longer pay for a war being fought mainly by privateers at sea and mercenaries on land. A complete defeat was only averted by the internal divisions of Poland-Lithuania. Negotiations began at Torun but broke down during 1462. Desultory fighting thus continued through 1465. The Poles made small but steady gains, whittling away at the shrinking domain of the Order until they captured Chojnice (September 28, 1466). Pope Paul II mediated the Second Peace of Torun (October 19, 1466) in which the Sword Brothers lost half of Prussia outright and accepted Casimir’s suzerainty in the rump lands left to them. This entry was posted in Ottoman, Poland, Prussia, Wars by MSW. Bookmark the permalink.